A gardener’s work is never done, and that goes double for an expanding botanical garden like ours. The hum of heavy machinery has become a constant. That humming will stop soon, however, and the focus will change to getting plants in the ground. The goal for having the future Gardens planted is June 2009. Can you believe it? Ongoing is a project to renovate the plant beds along Thomasson Drive. For sometime now they’ve been embarrassingly overrun with torpedo grass (Panicum repens) and nutsedge (Cyperus). The thatch palms (Thrinax radiata) and dwarf variegated bougainvillea (Bougainvillea sp.) planted earlier this year have established themselves and will be the backbone of the planting. Once the weeds are under control, we can dress the beds up with some colorful, low maintenance plants. Dr. George Wilder, our herbarium curator, recently was asked by Collier County to give a class on invasive plants, specifically Florida Exotic Pest Plant Council’s (FLEPPC) Category 1 plants. George always does things thoroughly—he gave a 3-day intensive class for 19 or so Conservation Collier and Park Rangers, among others. His classes included lectures, a lab exercise on leaf morphology, field trips and quizzes to cover the 67 plants on the list. The class textbook was the 2nd edition of University of Florida's Identification and Biology of Nonnative Plants in Florida’s Natural Areas. It’s a beautiful book. The 2nd edition is just out (see the attached cover). This was an amazing presentation and took him a lot of time to prepare for. He donated the $800 he received for the class to the herbarium. If the class would be useful to others in the area—other county employees, landscapers, certified horticulturists, master gardeners, etc.—he’s indicated that he’d be interested in earning more money for the herbarium. In the Garden, we continue to delight in the fragrance of the fiddlewood (Citharexylum spinosum). It’s positioned by the gate so that we brush the cascading branches on our way into work. Tassels of white flowers adorn the ends of pendant branches and contrast nicely with the shiny, dark green foliage. Its flowering season is waning – soon the black berries will begin to form. This is my favorite native shrub. 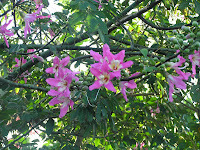 Around the base of the fiddlewood, bright pink petals signal pedestrians to look up. Hovering high above is the floss silk tree (Chorisia speciosa). This tree is our grafting experiment in progress. Volunteer Crafton Clift, a horticulturist, world traveler, and grafter extraordinaire, has been grafting on branches of other later-blooming chlorisias such as ‘Double Tem’, ‘Sunset,’ ‘Santi,’ ‘Elsie Page,’ and ‘Willis Red’. Signs indicating the names of the grafts dangle from the branches. 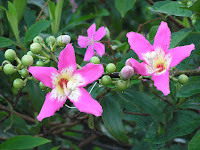 The goal is to find a cultivar that blooms later in the season so that more guests can enjoy the tree’s annual display. New grow lights installed in the Windstar Garden Room already add much needed light and will aid plant growth. Horticulture will soon begin to update the display for the bridal show on October 18th. The coral troughs stand empty, ready for new plants. The show will feature 35 to 40 vendors displaying all manner of wedding items. Public hours are 2 to 5pm. There are more opportunities coming up to visit the Tropical Mosaic Garden. Wednesday, October 15th and Saturday the 18th from 9am to 12pm. Please call ahead at 239-643-7275.